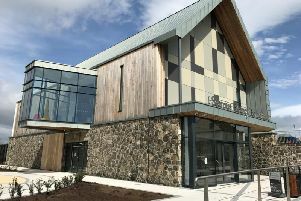 Funnyman Jake O’Kane, best known for his appearances on the BBC’s The Blame Game, has told how playing to the Burnavon Theatre in Cookstown is akin to “a family reunion”. While the sharp tongued comedian will not be performing at the Burnavon as part of his Gaggin’ on it tour, he has lined up a show for the Strule Arts Centre in Omagh on Saturday, January 9. With family ties to Draperstown, O’Kane advises audiences to be prepared for two hours of varying subject matter which ranges from a reflection on his diagnosis as a Coeliac sufferer and the joys of having a colonoscopy to the retirement of Peter Robinson from ‘Norn Iron’ politics. He’s looking forward to the show in Omagh, adding: “It’s been a while since I’ve been up to Omagh. I’ve been asked to play the club a few times so it will be good to be there. Jake’s show will also play the Millenium Forum Derry on January 23, as well as the Mac in Belfast on January 29 and 30. He insists he’s ready to take on the undoubtedly differing audiences at the various venues, and even welcomes the odd heckler. “I love hecklers!”, he says. “I always think it’s funny that in most gigs the audiences fill the seats from the front to the back, but at mine, the seats are filled from the back to the front! “There are things which work well in one venue compared to another, so it’s all about figuring that out when you get on stage and meet your audience. A show spokesperson promises: “In his inimitable style, Jake takes no prisoners as he deals with the good, the bad and the ugly of 2015. Jake weaves stories, current news and photos to give his take on the people, places and politics that made up the year.” Tickets from the various box offices.